These best free FLAC to MP3 converter software will help you convert single as well as multiple FLAC files to MP3. You can not only convert FLAC to MP3, but also carry out various other audio format conversions. There are various configurable options these audio converters provide, using which you can achieve desired conversion. After adding FLAC files to convert, some of these software simply let you convert them to MP3, while some provide options to change encoding options. You can set bitrate, frequency, channel, etc. for file conversion according to your choice. You can even add multiple conversion profiles in some of these freeware. Add meta tags to converted audio files using some of these free FLAC to MP3 converter software. Audio converters with Audio Normalization and Constant/Variable bitrate options are also available in the following list. Options to analyse files after conversion is available in one of these freeware; isn’t that interesting? Go through the list to find out more interesting features about these free FLAC to MP3 conversion software. A command line tool to convert FLAC to MP3 has also been included with the required syntax. Note: All the programs in this list have been tested to be found working and free from viruses. I like fre:ac and FFMPEG the most. fre:ac is an open source audio converter software that supports LAME and various other encoders. Also, it lets you set conversion parameters according to your choice. The same goes with FFMPEG, as it is feature rich, with an added advantage of a CMD tool. You can also checkout the list of best free Audio Pitch Changer Software, Audio Normalizer Software, and Audio Noise Reduction Software for Windows. fre:ac is an open source audio converter for Windows, Linux, and Mac. It lets you convert FLAC to MP3 easily. You can convert single as well as multiple FLAC to MP3 using this freeware. It comes with LAME encoder, which converts audio files to MP3. Apart from LAME, there are various other encoders that you can select according to your audio conversion needs. Some of the encoders available are: Bonk, FAAC, FLAC, Ogg Vorbis, etc. For conversion, add the FLAC file(s) that you need to convert, select the output folder, then start the encoding process. The configurable options are available under the Options menu, from where you can select an Encoder and then configure the selected encoder. The supported input and output audio file formats are: AAC, AIF, AIFF, BONK, VOC, FLAC, MP3, M4A, OGG, AU, SND, WAV, and WMA. fre:ac is an advanced audio converter that you can use to convert FLAC to MP3 and various other audio formats. FFMPEG can be used to convert FLAC to MP3 from command line. It is an open source and very famous command line audio and video utility, and can be used for recording, converting, streaming. There are various tools and options that FFMPEG offers, and one of them lets you convert FLAC to MP3. Navigate to the folder where FFMPEG is installed. Check for output in the folder where FFMPEG is installed. You can use FFMPEG for various other purposes. Checkout the homepage of FFMPEG to know more. You can easily convert FLAC to MP3 in Audacity. In fact, you can convert multiple FLAC to MP3 in Audacity. Audacity is a very famous multi platform and open source audio editor software with tremendous audio editing capabilities. Import single or multiple FLAC files to Audacity from its File menu. Once added, go to File menu again, and click on the Export Multiple option. In the Export Multiple window that opens, select the Format as MP3. Select the Bitrate and Channel Mode according to your choice. Change File split or Naming options according to your choice. Now for each audio file, you get option to edit metedata tags. Edit it or skip. Conversion will begin. Look for the exported files in the designated Export folder. As you can see, converting audio using Audacity is not a big deal, and can be carried out very easily. If required, you can edit audio files that you want to convert before conversion. 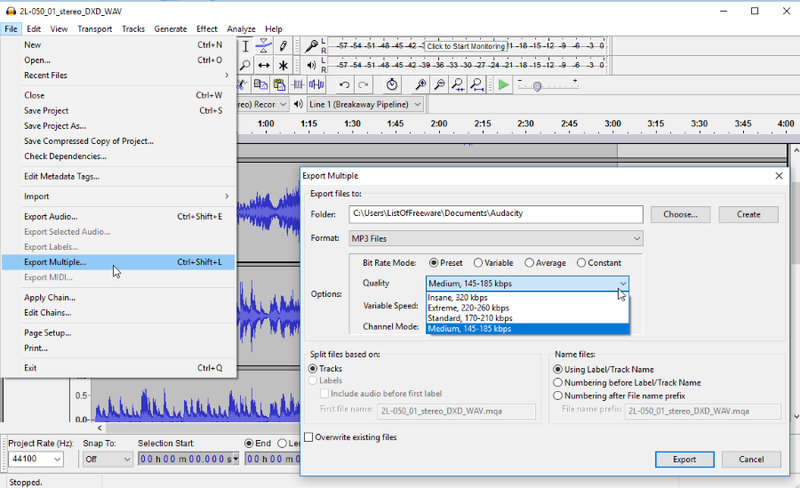 You can add several effects, filters, trim audio, split audio, merge audio, and do much more using Audacity. SoX or Sound eXchange is a cross platform, command line audio utility that you can use to encode FLAC to MP3. SoX on its own cannot encode MP3 files, therefore you will need to add LAME encoder library file to SoX for the same. The process is easy to carry out. After downloading and installing SoX, go to this page, and download the LAME library file (download the zip file, and not the exe file). Unzip the downloaded file, where you will find a .dll file named lame_enc.dll. Rename lame.enc.dll to libmp3lame.dll, then copy the dll file. Go to the folder where SoX is installed. In the installation folder, paste the libmp3lame.dll file. Open Command Prompt, and navigate to the folder where SoX is installed. The above screenshot displays the result without and with the LAME library installed. SoX is a versatile command line tool and can be used for several audio related purposes. 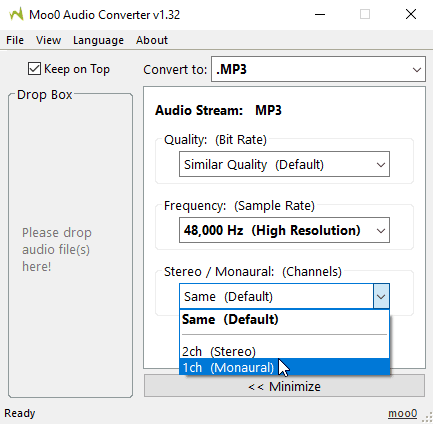 Moo0 Audio Converter is another good option to convert FLAC to MP3. It has a simple interface, and all you need to do is drag and drop the audio files on the interface that you want to convert. MP3 is chosen as the default output audio format. You can also select from a good list of audio formats as output format. Converted files are saved in the same folder as input files by default. You can change the output folder from the File menu. Some Advanced options are also available, where you can set output audio Quality, Frequency, Channels, and Volume. Talking about the supported audio formats, it supports a wide range of formats. Supported formats are: AAC, AIFF, AU, FLAC, M4A, MOV, MP3, OGG, WAV, RAW, etc. The interface of this FLAC to MP3 converter makes it easy for you to use for audio conversion. Also, the configurable options are easy to access. Moo0 Audio Converter also supports a good number of languages, such as: English, Russian, Chinese, French, Dutch, Italian, Korean, Turkish, Spanish, etc. Helium Audio Converter lets you batch convert FLAC to MP3 on your PC. It no only supports FLAC to MP3 conversion, but also various other audio format conversions. Apart from this, you can also set Encoder options, where you can change Bitrate and choose to use Noramalization. You can either select Constant bitrate or Variable bitrate for the converted audio files. A maximum of 320 kbps bitrate can be selected. Select the output folder to store converted files and begin the conversion. The conversion status is displayed on the interface. An option to Analyse files after conversion is also available. The supported audio formats to which you can convert audio files are: AAC, FLAC, M4A, MP3, MP4, MPC, OGG, WAV, and WMA. Hamster Free Audio Converter is another good FLAC to MP3 converter for Windows. The best part about this audio converter is that, you can convert audio files according to your music player device or simply select an audio format. For conversion, you will need to add audio files first. You can simply drag and drop FLAC files on its interface or browse and select them. Once added, move forward to device or format selection for conversion. Scroll down to view the formats available for conversion. Select MP3. Here in this window, you will also find an option which can merge multiple FLAC files to a single MP3 file. After that you can can proceed with conversion. The audio formats supported by this FLAC to MP3 converter are: AIFF, OGG, WMA, FLAC, MP3, MP2, AC3, AMR, WAV, AAC, and RM. Although you will not find any configurable encoder options, it is one of the best audio converter software out there, because of its ease of use and multi format support. VSDC Free Audio Converter is offered as a free Audio file converter from the makers of very famous VSDC Video Editor. It supports a lot of audio formats for conversion and can easily convert FLAC to MP3. Load single audio file, multiple audio files, add a folder, or RIP audio directly from DVD for conversion. A Tag Editor feature is available, which lets you edit audio files’ title, author, album, genre, year, etc. After selecting MP3 as output format, you can select from various encoding profiles. These profiles provide various bitrate settings for MP3 conversion, ranging from 64 to 320 kbps. You can even add an encoding profile manually by setting bitrate, channels, and frequency parameters. Other formats available for audio conversion are: WMA, AAC, M4A, AMR, OGG, AU, AIFF, and WAV. Once you have added FLAC files, chosen conversion profile, and selected output folder, carry out the conversion. The conversion status is displayed on the screen. Note: While adding a FLAC file, in the browser window, select the file type as All Files. It cannot detect FLAC files when All Audio Files is chosen as file type option. MediaMonkey is a free music manager software that can be used to convert FLAC to MP3. To convert FLAC to MP3 in MediaMonkey, LAME encoder is used; however, MP3 encoding in the free version of MediaMonkey is time limited. You can only convert audio files to MP3 for first 30 days after installation. But you can replace LAME encoder in MediaMonkey to remove this time limit. You can look here to see how to replace time limited LAME encoder with the free one in MediaMoneky. You can use the File Explorer tree on the left side of the interface to select the files you want to convert. You can convert single or multiple FLAC files to MP3 in MediaMonkey. Once you have added the files, select them all, then go to the Tools menu and click on Convert Format option. Select the output format as MP3. If you want, you can change MP3 encoder settings to set audio bitrate, VBR quality, and Stereo mode. In the Advanced mode, you can manually set sample rate, encoding quality, etc. Now select an output folder, select renaming option, and carry out the conversion. IQmango Audio Converter is another free Audio converter in this list, which can convert FLAC to MP3. Just like Hamster Audio Converter, it provides options to convert audio files according to media device as well as specific formats. Here, you can add single or multiple FLAC files for conversion. Once added, select the output format as MP3 from the Output format dropdown box. In this dropdown, you will also find options to select output formats according to various music player devices, such as iPhones, iPad, iPod, Android phones, Gaming consoles, etc. A slider that is available right next to the dropdown, lets you adjust output audio quality, also, you can select output folder to save converted files. Although there are various audio formats and devices to select for audio conversion, you will not find any encoder configuration options to vary audio bitrate. This versatile FLAC to MP3 converter can be used for various other audio format conversions as well. Supported output audio formats are: OGG, AC3, AAC, M2A, AMR, FLAC, WAV, etc. Free FLAC to MP3 Converter is a free and dedicated FLAC to MP3 converter software. It can be used to convert single as well as multiple FLAC files to MP3 easily. It is a very simple software that lets you add FLAC files for conversion, then converts them to MP3. As I said, you can add single or multiple files, select a folder to store the converted files, then begin conversion. Apart from the above mentioned options, you will not find any other options for FLAC to MP3 conversion. It is a simple software that only lets you batch convert FLAC to MP3. There is a premium version of this converter, which supports other audio file formats too, but that’s a paid one. Free MP3 WMA Converter is a free audio converter software and can be used as a FLAC to MP3 converter. Convert multiple FLAC files to MP3 using this freeware. You can even add a folder containing FLAC files for bulk FLAC to MP3 conversion. The best thing about this FLAC to MP3 converter is the presence of advanced configurable options for conversion. After adding files for conversion, select the output format as MP3, then set conversion format parameter. For MP3, you can set sampling frequency, bitrate (max 320 kbps), encoder quality, channel mode, filtering, VBR, presets, etc. A Tag Editor is also available, where you can add ID3v1 or ID3v2 tags to audio files. Add title, artist, album, genre, year, URL, etc. Once you start the conversion, the conversion status can be viewed on the interface. Free MP3 WMA Converter is another good option for FLAC to MP3 and other types of audio conversion. MediaHuman Audio Converter is a simple yet feature rich audio conversion tool. It provides a very straightforward interface that makes audio conversion an easy task. To convert FLAC to MP3, you can browse or drag and drop FLAC files in this freeware. It lets you select MP3 as output audio format with various encoding options. In fact, it provides encoding options for all output formats it supports. Another interesting feature about this FLAC to Audio converter is, it searches for album cover art automatically on DiscOgs, Last.fm, and Google Images, and adds them to the audio files with missing album art. For FLAC to MP3 conversion, you can either select from a list of bitrate options, or manually define bitrate, channels, and sample rate. You also get to choose the output folder to save converted MP3 files. MediaHuman Audio Converter is one of the simplest but powerful FLAC to MP3 converter out there. Free FLAC to MP3 is another dedicated and free FLAC to MP3 converter software. It can be used for batch FLAC to MP3 conversion, and also single conversion. There are two things that you can configure before conversion, output folder and output audio bitrate. There’s a limitation with maximum audio bitrate of output file. It is limited to 128 kbps, which can be an issue for some. After adding files and setting things up, begin the conversion. The conversion status is displayed right on the interface. The only input audio format supported is FLAC and the output format is MP3. Simple Audio Converter lets you batch convert FLAC audio files to MP3 for free. While conversion, you can select output MP3 bitrate from 320 to 40 kbps bitrate. Add the FLAC files you want to convert, select output format as MP3, set bitrate, select output format, and carry out the conversion. The format support is a bit limited with this audio converter. Supported Input formats are: FLAC, MP3, WMA, PCM, and OGG. Supported output audio formats are: MP3, WMA, and WAV. foobar2000 is a free and advanced audio player for Windows. It supports a lot of audio formats and lets you convert audio files as well. You can convert FLAC to MP3 using foobar2000 without any hassle. The only thing you need to do before conversion is, download and install the foobar 2000 encoder pack. Once the encoder pack is installed, you will not even need to restart foobar2000 for conversion. Single or multiple FLAC files can be encoded to MP3 using this freeware. Add the files that you want to convert. Select all the added audio files, right click and go to the Convert option in the context menu. In the Conversion Setup window, select the output file format as MP3 (LAME). Double click on the MP3 (LAME) option there to set output audio quality in bitrate. Once done, click Back, and select the destination folder. Click Convert to begin conversion through this free FLAC to MP3 encoder. That’s all. foobar2000 is a highly customizable audio player software that you can use regularly for sorting, playing, and also converting your music collection. Convert To MP3 is a pretty simple Audio to MP3 converter software with a neat interface. Add single or multiple FLAC files, select an output folder, then select quality level of output MP3 file. You can either select quality level from 1 to 5, leave the output quality as same, or choose custom quality parameter in form of audio bitrate. Begin the conversion and while conversion, the progress is displayed. It is one of the simplest FLAC to MP3 converter out there. Although Aunsoft Video To Audio Converter is primarily a video to audio converter, it can be used to convert a wide range of audio formats too. Use it to batch convert FLAC to MP3. The MP3 encoding options can be changed for desired conversion. Change MP3 audio’s bitrate, channels, frequency, and more. You can also select from various other audio formats for conversion, such as: WAV, M4A, OGG, WMA, AC3, AAC, etc. An option to merge all the added files for conversion to a single file is also available. The input audio files supported for conversion are: MP3, AC3, OGG, APE, MPA, AIFF, MP2, RAM, FLAC, AAC, etc. Apart from this, a wide range of video formats is also supported by this converter software. Power MP3 WMA Converter is another good audio converter software to convert multiple FLAC to MP3. It supports a very large number of input audio files, which you can convert to MP3, WAV, WMA, OGG, APE, MP2, and M2A. You can set output format, then select desired audio bitrate, and an outout folder to save the converted files. In Configuration settings, you will find options to set audio format encoding. For example, for MP3 encoding, you can configure resampling rate, stereo mode, quality reset, encoding method, VBR, and other options. Additional options let you play a loaded audio file, and you can even burn converted file to CD through this FLAC to MP3 converter freeware. VLC Media Player is a well known media player, and can be used to convert FLAC to MP3. To convert FLAC to MP3 in VLC media Player, all you have to do is add the FLAC files for conversion and begin conversion. You can carry out single and multiple FLAC to MP3 conversion in VLC. To add files for conversion, go to Media menu and click on Save/Convert. After adding files, click on Convert/Save option. Now, you can select MP3 as conversion profile. To set MP3 encoding options, click on Edit profile option, right next to the profile selection option. Here, go to the Audio Codec tab, then set Birtate, Channels, and Sampling Rate options. you can even apply an audio filter if required. After setting a destination folder, begin conversion. VLC Media Player is one of the most versatile media player, known for playing almost all kind of media files.